Northern Italy's famous Alta Via long-distance walking routes are spread across the Dolomites, running roughly north to south and reaching as far as the Austrian border. 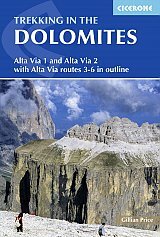 There are six of these routes, and they increase in difficulty: Alta Via 1 has few exposed sections and is suitable for novice alpine trekkers; AV2 is much more challenging, only suitable for experienced alpine trekkers with a good head for heights, while AVs 3-6 have extended via ferrata sections and considerable exposure. AVs 1 and 2 are described in detail in this guidebook. The 120km AV1 is described over 11 day stages; AV2 covers 160km in 13 days and is more strenuous and technical. Overnight stops are at mountain huts or guesthouses. The demanding AV3-6 routes are described in outline. Now a World Heritage Site, the Italian Dolomites make a first-rate trekking destination. There is an excellent network of paths dotted with welcoming 'rifugi' (mountain huts) in stunning locations, and efficient public transport serving key trekking points.